Florida Power & Light is planting large devices across Florida that look like trees and harness the power of the sun to create electricity. The utility has begun installing these 24-foot-tall, solar-powered “trees” to bring attention to the use of solar energy. Boynton Beach in recent weeks installed two of them at Oceanfront Park, 6415 N. Ocean Blvd., becoming the first city in Palm Beach County to offer the solar installation as a public amenity. In Davie, West Palm Beach and Miami, FPL also has installed solar “canopies,” larger devices that provide shade over cars in parking lots, in addition to generating electricity. FPL’s pilot program, called SolarNow, kicked off two years ago, allowing customers across the state to opt into a $9 extra charge on their monthly bill to fund public solar-power generation. More than 450 Boynton customers opted into the program. 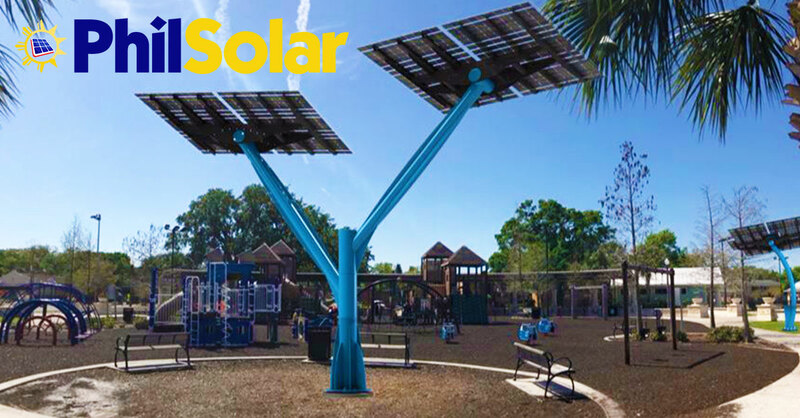 Tall, bright blue and Y-shaped, Boynton’s solar trees have USB ports and outlets where parkgoers may plug in to charge their cellphones. In Boynton, FPL soon will put the finishing touch on the new trees in the park: educational boards that explain how light goes into the panel and is converted into energy, she said. “They are a tremendous educational tool for folks to see what solar energy looks like and interact with in a way that they haven’t been able to before,” she said. Boynton residents soon will start seeing more solar energy structures around the city. Officials recently approved plans for solar canopies at Oceanfront Park, and Barrier Free Park, 3111 S. Congress Ave, Daly said. They’ll be added within the next four months. FPL also will pay the city about $4,000 per year to lease the land used for the solar structures.